It’s taken science a long time to catch up to what owners already knew about their furry friends. For years the men in white coats tried telling us Fido only wants to be around us for food and security. But finally, a batch of shocking new studies have confirmed our suspicions that yes, our dogs really DO love us… And not just for food! Scientists situated at Emory University, Atlanta, discovered that the part of the brain responsible for producing positive emotions and love is very similar in dogs and humans. Through a long process, the scientists were able to train dogs to sit still in MRI scanners. Up until now dogs had to be put under anaesthesia to remain still inside these machines, making emotional scanning useless, but with specially trained dogs science can take us to the next level of canine understanding. Those conducting the study taught dogs to associate specific hand signals with food, and when presented with these signals while inside the scanner, the dog’s caudate nucleus showed a response similar to what can be seen in humans when presented with good news, showing that our brains are far more similar than we previously thought. Not surprising given our 30,000 year history of friendship with the domestic dog. What does that have to do with love? There’s more! Since the breakthrough, a research team in Hungary have been able to demonstrate that both dogs and people react to human voices in a similar way, with emotionally charged voices and the voices of loved ones sparking a stronger response. This was a shocking discovery, as the area responsible for recognizing the calls of same-species animals, the “temporal pole”, has never been shown to respond to people’s voices outside of the human brain before, not even in our closest primate relatives! But that’s not all! 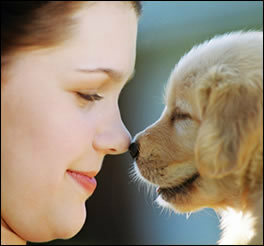 The biggest revelation comes with the discovery of the presence and action of oxytocin in dogs. Oxytocin is a chemical in the human brain which causes us to feel love when released, earning it the moniker of “the love hormone”. Research has shown that during intimate situations and encounters with companions, the oxytocin chemical is released in the dog’s brain through a mechanism shockingly similar to that of a human brain! In other words, you and Fido feel the same love when together! 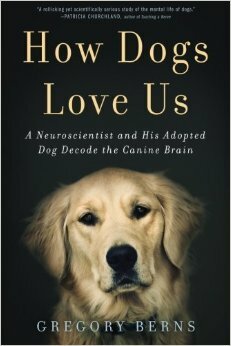 Gregory Berns, the first neuroscientist to successfully perform an MRI scan on a conscious dog, has written an entire book on this topic entitled “How Dogs Love Us: A Neuroscientist and His Adopted Dog Decode the Canine Brain”, a must read for owners!